It is usually safe to count the Aces and Kings in your hand, and assume that they will take a trick. In the picture below, notice that I have a fairly even distribution of cards amongst the 4 suits: 3 Diamonds, 3 Hearts, 3 Spades, and 4 Clubs. I have 3 Aces and one King. It is possible that someone else will have a deficiency in one of these suits, and be able to trump my Aces or King... but that is not the most likely case. Given no other information, I will bid 4 tricks. You can replay this hand to see what happened in one particular situation. 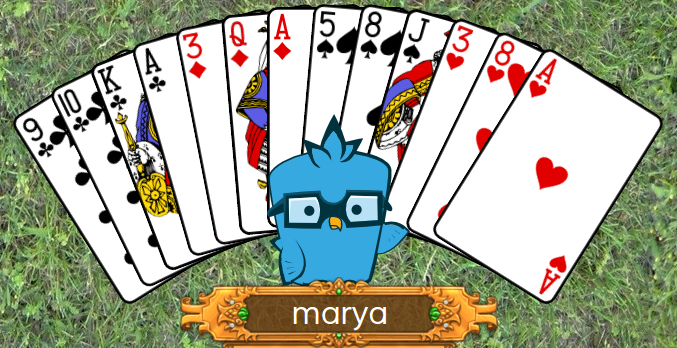 In the end, I took tricks with all the cards that I counted on, and I wound up taking 1 extra trick too. Here's a replay that worked out differently, though. I have the exact same hand, and my bid was the same. If you look at the bids individually, they all seem pretty reasonable. However, I was unable to win a trick with my King of Clubs, and my teammate did not make their bid, either. This led to our team being set back -60 points to start. As a consolation prize, our opponents gained 3 bags. This example demonstrates how the success of your bid depends on the distribution of cards over all the players. A reasonable bid can usually be fulfilled. However, there are times when a reasonable bid just can't be met. Your team may get set, and there's nothing either partner can do about it. This is a handy place to remind you that Spades is a team game. If you partner plays a high card, such as an Ace or King, and the trick gets trumped by your opponent, consider carefully whether you should support your partner by taking an extra trick in addition to what you bid, if possible. If the total of all bids is on the high side (13, 12, or even 11), chances are good that your partner does not have a lot of leeway and your team needs every trick they can take to make their bid. So look for opportunities to make up for a lost trick, as the hand plays out.